Last month I discovered the most amazing site on the web Mapbox.com. Well if you have an obsession with maps like I do then you will think it’s an awesome site. I used Mapbox to create a map of my favourite place and then used it for a fun IKEA Kids table hack. What’s so good about Mapbox? It’s free, you can make a map of anywhere you want in the world in any style and to the detail of your choice. As I love to upcycle and craft with maps I can use Mapbox to create and print a map of my favourite places around the world to personalize my projects. After discovering Mapbox, I was hunting around the house looking for something to transform with maps. That’s when I came across the much neglected IKEA Kritter kids table in the games room. I’ve had the table over 15 years, it used to be used as computer table but now that the kids are all just about over 6ft they would look ridiculous sitting around the table. It was time for an IKEA kids table hack and to repurpose this old bit of furniture. Having recently discovered image transfer with Mod Podge with my map picture frame, I decided to use this technique again for this table upcycle. I could have as easily chosen decoupage like with my previous map table but I prefer the finish you get with image transfer. IKEA kids table my table was an old IKEA Kritter table. 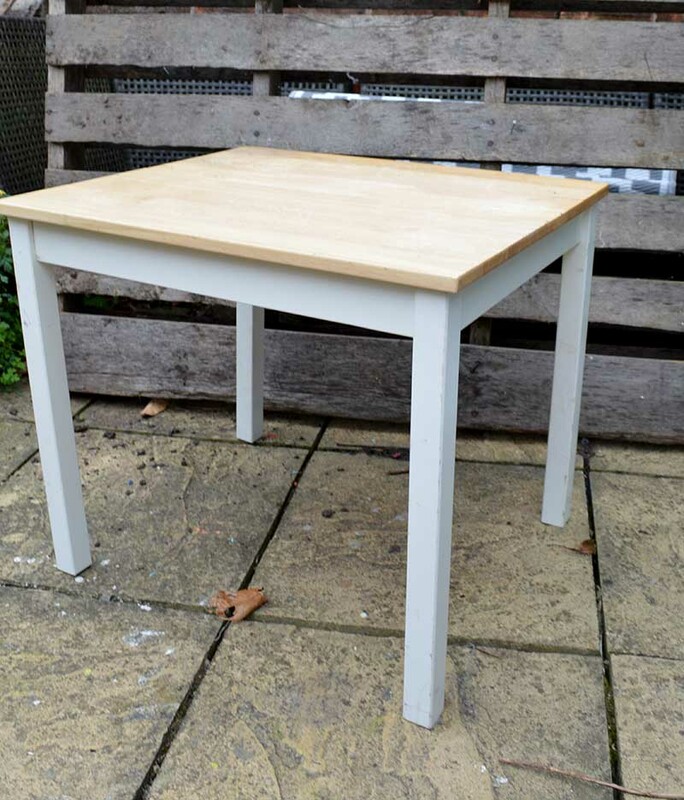 But this upcycle would work with any other small table Ikea or not. Mirror image inkjet printed Map, I used Mapbox to generate my map (see below). 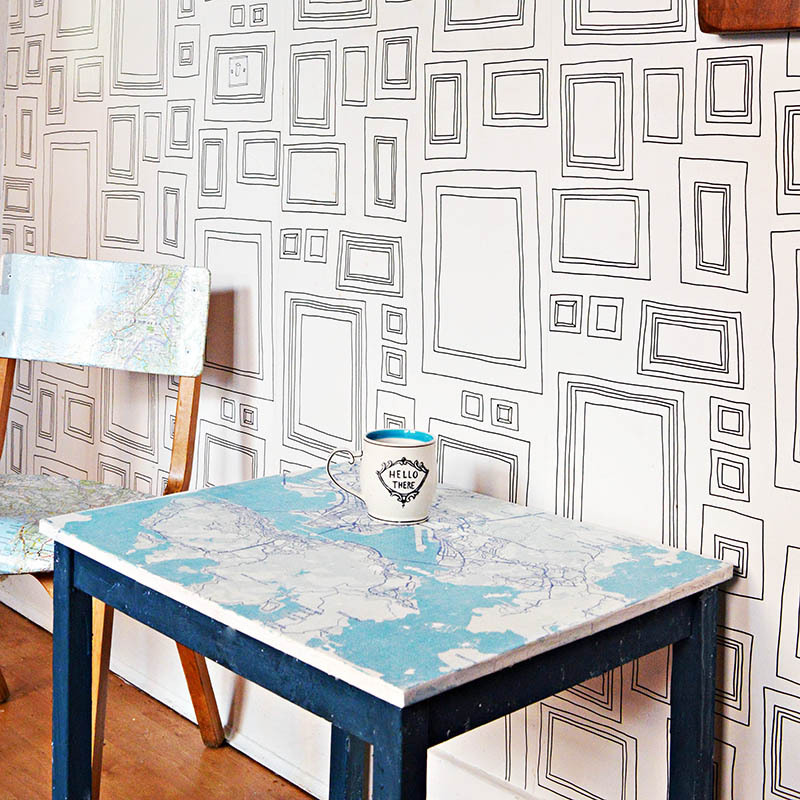 However, you can print free maps from sites such as Remodelaholic. I got my local print shop to print my map for me. Glue bursh, sponge and water. Mapbox.com is free to use all you need is to set up an account. I suggest you have a play around with it , looking at all the different map styles available and zooming into your favourite cities around the world. When you have decided where you want to create a map of and in what style you will need to generate a static image of that map. There is a handy tutorial on Agusyornet that shows you just how to do that. If you follow me you will probably have worked out that Hong Kong is my favourite city in the world it is where I was born and bought up and where I recently took my kids back to visit. Therefore that was the city map I used for this project. I generated a static map image on Mapbox with the STANDARD streets style. I zoomed into the city of Hong Kong until I had enough detail that I needed for this upcycle. Following Agusyornet instructions I copied this static image URL to create a new web page. This image was then copied and pasted straight into Photoshop. In Photoshop I made my canvas the same size as my IKEA Kritter table top and as I wanted a monochrome blue look to my map I adjusted the colours of the map. If you prefer, you can use other photo image software packages for your maps such as pic monkey and Canva and Illustrator. The table top was 50cm by 60cm, so the map was printed out over 6 pages of A4 paper in mirror image on an inkjet printer. I hate prepping furniture for painting, that is primarily why I use chalk paint. Also, I do like the finish chalk paint gives. 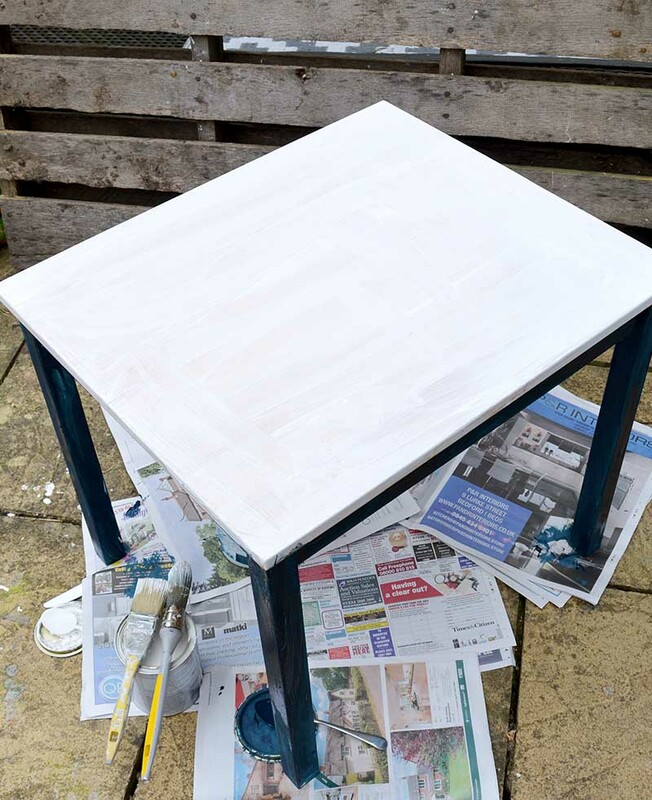 I painted the legs of the IKEA Kritter table dark blue and the top white. I painted the top white as there was a lot of white on my printed map, and the white doesn’t transfer. As there is no white ink on the page. Once the chalk paint had thoroughly dried, I liberally covered the whole table top with Mod Podge. The front of every map page was also covered in Mod Podge and stuck face down onto the table. I warn you this bit can be tricky in making sure you have your map the right way round. I have to concentrate really hard when doing this as the mirror image of the map is quite confusing. The first time I did this I got it all back to front and had to print off another map and start again. Leave the Mod Podge to dry and least for a few hours. Now comes the fun part, using a wet sponge rub away at the printed paper. As the paper turns to mush and comes away the ink map is left printed onto the table top. Carry on rubbing until all the paper is removed. This will take a little while and involve a lot of rubbing. To finish off my table I applied a coat of furniture wax to seal and protect the top. I’m really pleased how my little IKEA kids table hack turned out. I love the monochrome blue colour of the map. Also when sitting down for a coffee, looking at the map of Hong Kong reminds me of all may favourite places within the City. I show the boys where are house was and all the places we used to visit. 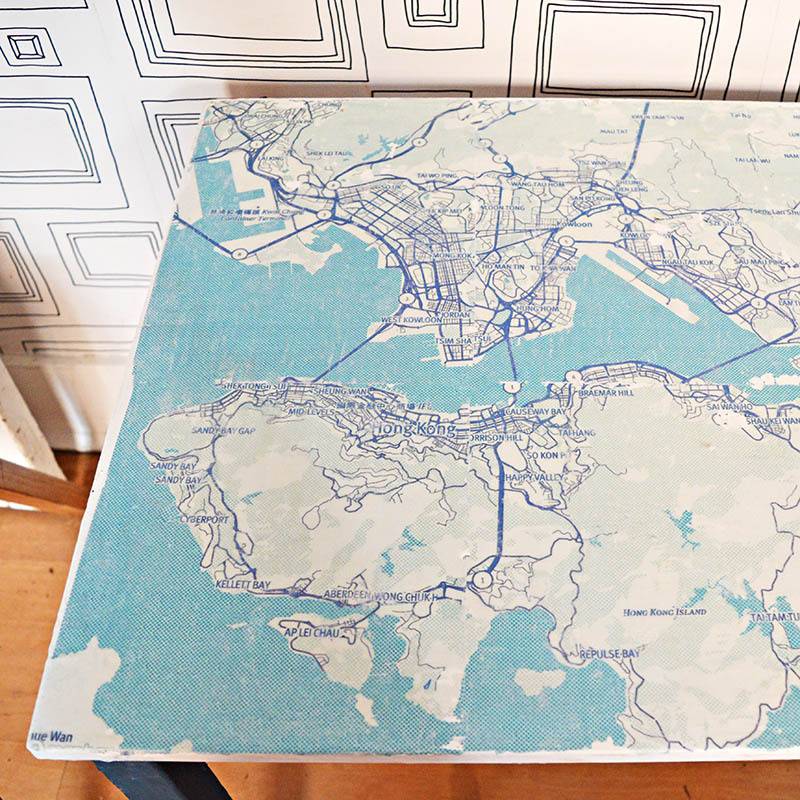 The table also fits with lots of my other map upcycles like my decoupaged map chairs and IKEA lamp hack. 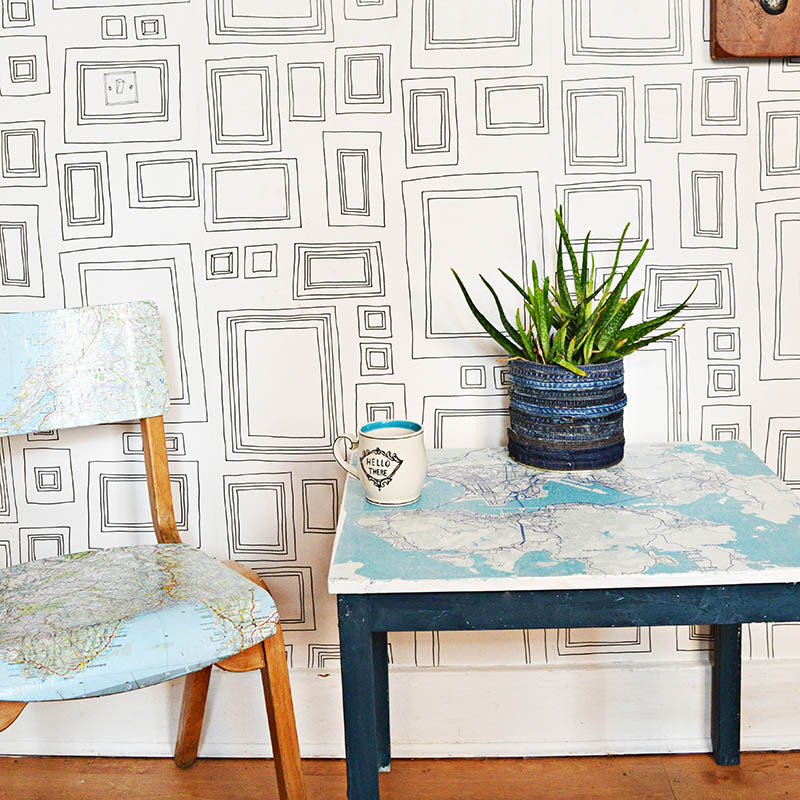 If you want some more ideas for getting maps into your home decor you should check out my all my other map crafts and DIY’s here. Thank you Julie, and thanks for the share. Using Mapbox.com is a great way to hold on to vacation memories and would make great gifts. I can tell you’re going to have lots of fun with this! Thank you for sharing with us at Celebrate Your Story, and have a great weekend. 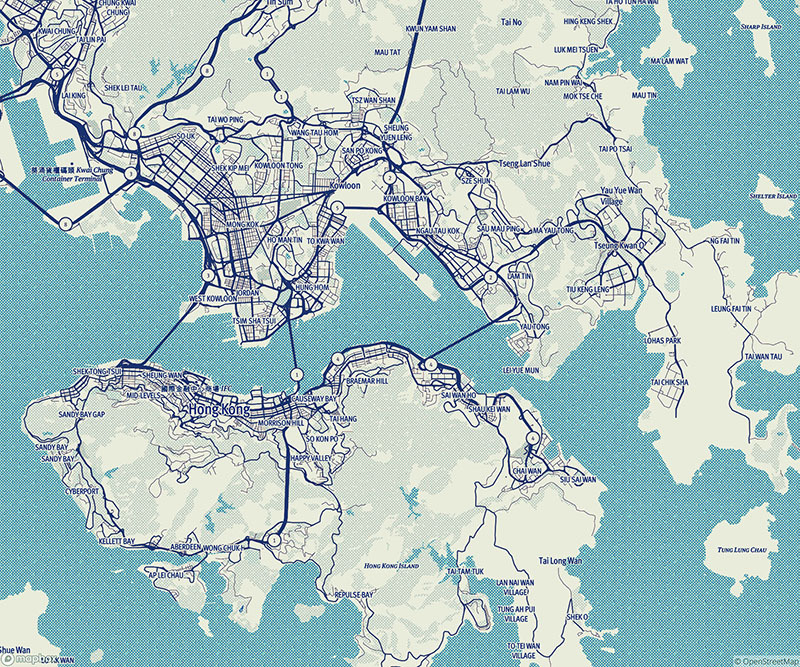 Yes MapBox is my new favourite tool on the internet. Thank you. This is such a fabulous post! Your project came out so beautiful just the perfect unique table with such character! Thank you, Janine. I enjoyed making them. This is such a great update!! I love how the table & chair look together! Thanks for sharing at #merrymonday We hope you will link up again! 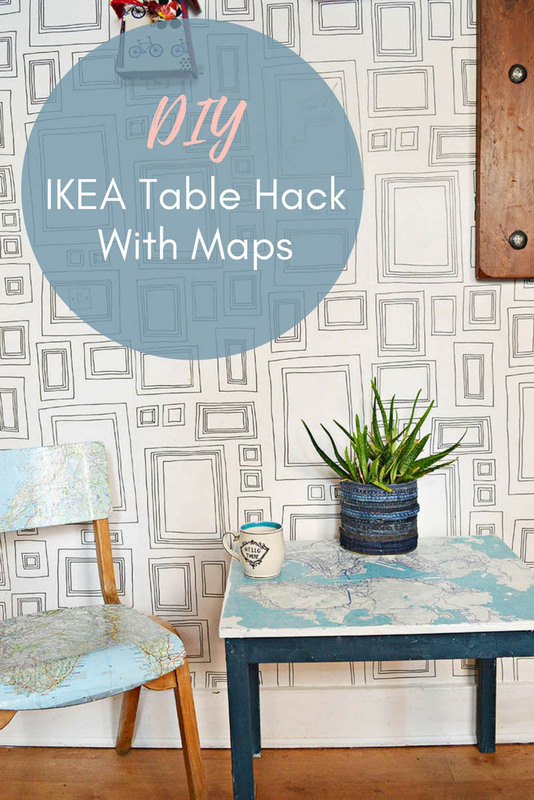 I adore using maps for furniture, and what great map site tips will be heading over there asap, thanks for sharing your project at #fridaysfurniturefix , love having you Claire! Thank you, Brenda I love to link up when ever I have a furniture DIY. Another fabulous map project Claire!! How fun for little ones to be sitting at that table and learning about the map while they are busy playing and having lots of fun!!! Fabulous idea! Thank you for sharing your fabulous project with us over at Waste Not Wednesday! Thank you Sam, I just can’t get enough of crafting with maps. I’m a huge fan Mod Podging with maps, this table and chair look AMAZING! Big fan of your blog, too! Thank you so much. Give me a pot of Mod podge and pile of maps and I’m happy. I love how you used Modge Podge to transfer the map to the table top. I love maps, I’ll have to check out the Mapbox site. Stopping by from the #HomeMattersParty linkup. Thanks, Nicole. Mod podge image transfer is my new favourite craft technique. Thank you! Mapbox is a fun tool, I’ve got lots of maps to make. I love all of your map projects and this one was filled with so many great tips. Thanks for the inspiration. Thank you, Denise. There are plenty more map projects to come! So cute, Claire! 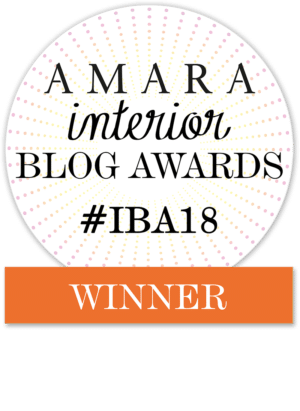 Thanks for sharing @ Vintage Charm–pinned! Thank you so much, I’m glad you have found tings you want to try good luck with them. Thank you Kathleen. I do like nautical maps to they sound perfect for your sons room. I love the table, and the map. So cute and whimsical. I’ll have to check out that Map site because I’ve been wanting to try that transfer method as well. Thank you Toni. I will be on Mapbox soon thinking of maps of more of my favourite places and crafts to do. Good luck with your image transfer. Thank you Michelle. MApbox is fun but a bit daunting at first but if you follow the tips and have a play around you soon figure it out. Thank you for introducing me to Mapbox! I am so excited to get started on some map projects of my own! Your ideas are so awesome! Thank you, Helen. I’d love to see what you come up with. Mapbox is good fun for making maps. Claire that is such a cool technique I thought you were just going to glue the maps on the surface but this has more of a lived in look. Very nice, pinning to try in the future. Thank you, Mapbox is a great tool I bet you could make nice map of Greece using it. 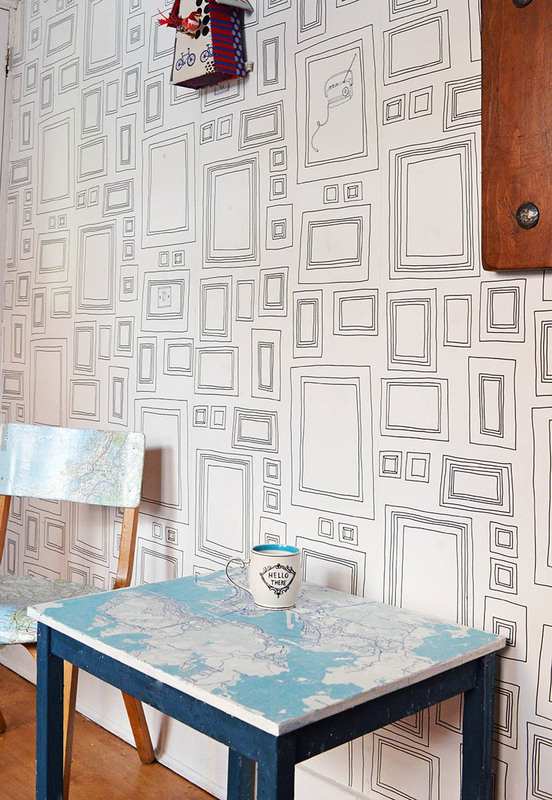 When I first saw this, I thought you had decoupaged the map to the tabletop. I had no idea you could actually transfer the image to the surface using Mod Podge. This is a really cool project. I am imagining all kinds of ways I could use this technique. I will also check out Mapbox. Thanks so much for the idea. Thank you! The image transfer is really easy and Mapbox is a cool tool. I love map projects too. Thank you for sharing that link, Claire. It’s good to know that you can create and style the map of your choice. I like the blue color scheme you chose for the table. Great makeover! Thank you, Julia. I’m going to be making more maps in Mapbox.